Step 2: Come back here, scroll down, and enter you receipt details to claim your gifts. Allergies can manifest in everything, from the food you eat to what you keep in your bedroom closet. 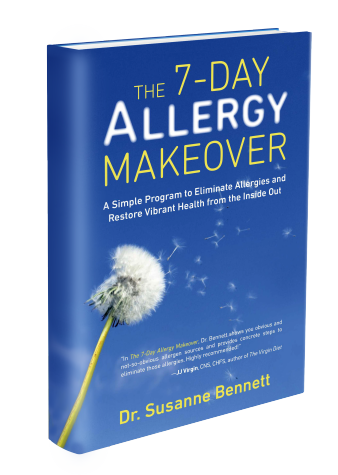 In her new book The 7-Day Allergy Makeover, Dr. Bennett shows you obvious and not-so-obvious allergen sources and provides concrete steps to eliminate those allergies. Highly recommended! Dr. Bennett has developed a foolproof method for reversing the serious problems encountered when someone suffers from allergies. I highly recommend her book and think it will change the lives of those that use it. If allergy symptoms have taken over your life or your child’s life, you simply cannot afford to be without Dr. Bennett’s groundbreaking program. The 7-Day Allergy Makeover is the first book that gives people the ability to control their own allergies. Dr. Susanne Bennett has done a phenomenal job making this complex topic simple and laying out the easy steps that will reverse years of symptoms. 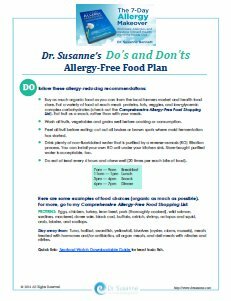 Dos and Don'ts Allergy-Free Food Plan so you'll know exactly what to eat. My Body Balancing Technique video to double your energy in 5 minutes. 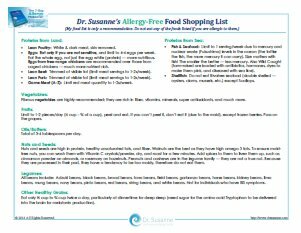 Allergy-Free Shopping List - save time at the store! Morning and Evening Holistic Meditation Audio MP3s to calm your system. and you'll be given instant access to the Bonus Gifts. Get Access to Book Gifts!